It's a fact - frequent hand washing is one of the best ways your family can fight off germs and stay healthy as cold season sets in. Of course, you should feel free to wash frequently year-round. However, how you wash your hands matters. Not washing correctly limits hand washing effectiveness. Poor hand washing habits can also, surprisingly, hurt your green footprint. Keep hand washing effective and green with the following tips. Frequent hand washing matters more than you think. The Centers for Disease Control and Prevention (CDC) notes that the, “Simple activity of frequent handwashing has the potential to save more lives than any single vaccine or medical intervention and is the most effective and inexpensive way to prevent diarrheal diseases and pneumonia.” Washing your hands should happen after your child (or you) plays outside, especially at a public place, such as a park. Wash up after caring for, or being exposed to a sick person, after changing a diaper and before and after you care for a wound. You should always wash after coughing, sneezing or blowing your nose. Hands also need washing when prepping and cooking food or after you or your child touch an animal. Of course, wash up after using the bathroom too. Young children need to be shown how to wash correctly. Standing by their side and demonstrating can be helpful. That said, even many adults can use a hand washing primer. First, wet your hands with clean running water. Warm or cold water is fine according to the CDC and the World Health Organization (WHO), although warmer water is more comfortable. Apply your soap. Rub your hands together and scrub them well. Be careful to scrub the backs of your hands, between your fingers, and under your nails and rings too. This scrubbing should continue for at least 20 seconds. If your child has problems counting out 20 seconds, have him hum the “Happy Birthday” song from beginning to end twice. 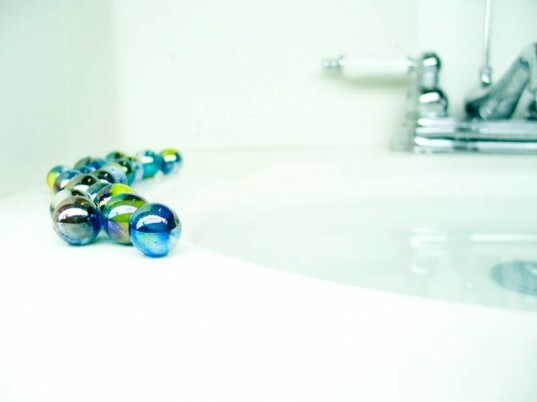 Rinse your hands well to run off soap and germs under clean running water. Dry your hands on a clean hand towel. Plus, and this is key, right now there is actually zero current research that supports any extra health benefits from having antibacterial-containing cleansers, over basic soap and water, for hands, dishes or other items in the average healthy household. WHO says that kids who wash their hands regularly with soap and water have 53% lower incidents of diarrhea and they also say that there’s no added benefits for kids who use antibacterial products. The CDC also advocates against antibacterial soap, noting that if your hands are visibly dirty, antibacterial rubs are not effective, and that plain old soap and water works best. Lastly, unless your goal is to grow an army of massive super germs (germs that can’t be killed) I’d skip the antibacterial soap. Instead of antibacterial soap, which costs more, is dangerous and is not effective, use basic organic or natural, non-toxic soap. 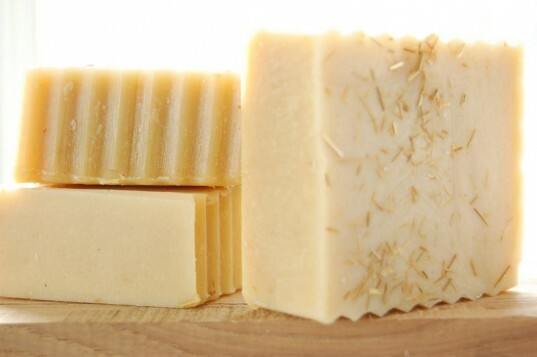 You can try something like the Organic Goats Milk and Lemongrass soap shown above, or look at soaps offered by Dr. Bronner, Method or Vermont Soap. To avoid plastic waste and excess trash, you should be using either bar soap or soap in a reusable pump. Kids can make a holy mess of bar soap, so at my house we go with refillable soap pumps. It’s super easy. You simply fill up on soap at the local co-op (reuse the same carry-along bottle) and then refill the pump. Most co-ops and other natural food stores carry liquid soap in bulk. If you can’t find any, buy the biggest bottle of liquid soap you can, which is better than a thousand small plastic bottles. Look for stainless steel or glass soap pumps ideally (no plastic). If you’re looking for pumps, check your local thrift store first to go green with reuse, then look at other stores. Post Road Vintage makes the most amazingly pretty Mason Jar Soap Dispensers in clear and white, as shown above, and many are made with recycled jars. You can find an array of stainless steel soap pumps at Simple Human, while bamboo and other soap pumps are available at Crate & Barrel. Image by sol_one via sxc. We all know that leaving the water running while we brush our teeth, wash dishes or do other home tasks is a huge waste of water. That said, you’re not going to save much by simply turning the water off for those 20 seconds you’re scrubbing your hands. Still, there are ways to conserve water during hand washing. First, you can install a simple inexpensive faucet aerator (check at a home maintenance store). Aerators reduce excess splash and slow down water flow, thus conserving water. People also unknowingly waste water by not turning the water faucet all the way off. A few drips is nothing, but those drips add up and can equal quite a lot of water waste over time. If you don’t think that conserving every drop of water you can is important, check out the movie Flow. 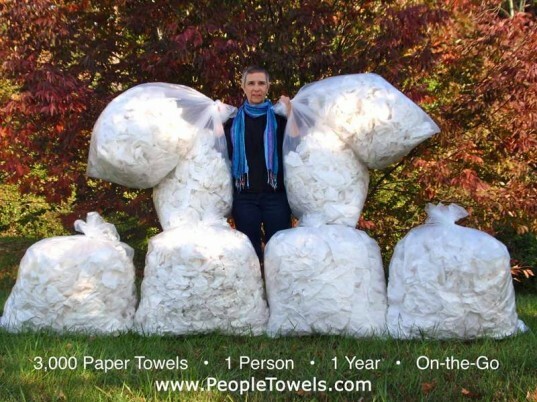 Mary Wallace, PeopleTowels' visionary & co-founder showing the amount of paper towel waste generated by 1 person outside of the home a year in the US. Many people think that paper towels are much safer and more healthy than cloth towels. You hear this argument even more during cold and flu season. In public spaces, unless you use personal, reusable towels like PeopleTowels, this makes sense. At home though, using paper towels is an insane waste of trees and money. According to most health organizations, if your family washes their hands properly, it’s fine to use the same cloth hand towel. If someone in the home is sick, the Canadian Lung Association recommends giving the sick individual their own hand towel and switching out hand towels frequently. If you can’t get over paper towels, then at least consider 100% recycled paper towels. The Natural Resources Defense Council (NRDC) notes that 544,000 trees can be saved annually, if every U.S. household replaced a single roll of virgin fiber paper towels with 100% recycled ones. Lastly, buy organic cotton or other sustainable material hand towels and change them out once a week. Frequent hand washing matters more than you think. The Centers for Disease Control and Prevention (CDC) notes that the, "Simple activity of frequent handwashing has the potential to save more lives than any single vaccine or medical intervention and is the most effective and inexpensive way to prevent diarrheal diseases and pneumonia." Washing your hands should happen after your child (or you) plays outside, especially at a public place, such as a park. Wash up after caring for, or being exposed to a sick person, after changing a diaper and before and after you care for a wound. You should always wash after coughing, sneezing or blowing your nose. Hands also need washing when prepping and cooking food or after you or your child touch an animal. Of course, wash up after using the bathroom too. Young children need to be shown how to wash correctly. Standing by their side and demonstrating can be helpful. That said, even many adults can use a hand washing primer. First, wet your hands with clean running water. Warm or cold water is fine according to the CDC and the World Health Organization (WHO), although warmer water is more comfortable. Apply your soap. Rub your hands together and scrub them well. Be careful to scrub the backs of your hands, between your fingers, and under your nails and rings too. This scrubbing should continue for at least 20 seconds. If your child has problems counting out 20 seconds, have him hum the "Happy Birthday" song from beginning to end twice. Rinse your hands well to run off soap and germs under clean running water. Dry your hands on a clean hand towel. Plus, and this is key, right now there is actually zero current research that supports any extra health benefits from having antibacterial-containing cleansers, over basic soap and water, for hands, dishes or other items in the average healthy household. WHO says that kids who wash their hands regularly with soap and water have 53% lower incidents of diarrhea and they also say that there’s no added benefits for kids who use antibacterial products. The CDC also advocates against antibacterial soap, noting that if your hands are visibly dirty, antibacterial rubs are not effective, and that plain old soap and water works best. Lastly, unless your goal is to grow an army of massive super germs (germs that can't be killed) I'd skip the antibacterial soap. To avoid plastic waste and excess trash, you should be using either bar soap or soap in a reusable pump. Kids can make a holy mess of bar soap, so at my house we go with refillable soap pumps. It's super easy. You simply fill up on soap at the local co-op (reuse the same carry-along bottle) and then refill the pump. Most co-ops and other natural food stores carry liquid soap in bulk. If you can't find any, buy the biggest bottle of liquid soap you can, which is better than a thousand small plastic bottles. Look for stainless steel or glass soap pumps ideally (no plastic). If you're looking for pumps, check your local thrift store first to go green with reuse, then look at other stores. 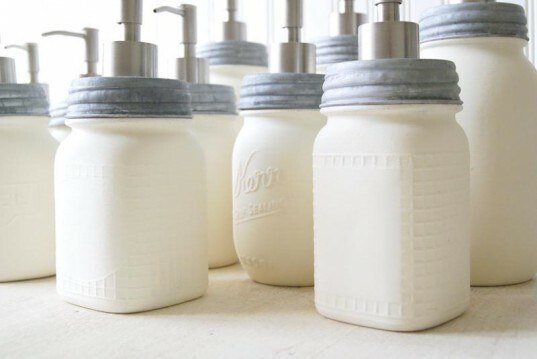 Post Road Vintage makes the most amazingly pretty Mason Jar Soap Dispensers in clear and white, as shown above, and many are made with recycled jars. You can find an array of stainless steel soap pumps at Simple Human, while bamboo and other soap pumps are available at Crate & Barrel. We all know that leaving the water running while we brush our teeth, wash dishes or do other home tasks is a huge waste of water. That said, you're not going to save much by simply turning the water off for those 20 seconds you're scrubbing your hands. Still, there are ways to conserve water during hand washing. First, you can install a simple inexpensive faucet aerator (check at a home maintenance type store). Aerators reduce excess splash and slow down water flow, thus conserving water. People also unknowingly waste water by not turning the water faucet all the way off. A few drips is nothing, but those drips add up and can equal quite a lot of water waste over time. If you don't think that conserving every drop of water you can is important, check out the movie Flow. Many people think that paper towels are much safer and more healthy than cloth towels. You hear this argument even more during cold and flu season. In public spaces, unless you use personal, reusable towels like PeopleTowels, this makes sense. At home though, using paper towels is an insane waste of trees and money. According to most health organizations, if your family washes their hands properly, it's fine to use the same cloth hand towel. If someone in the home is sick, the Canadian Lung Association recommends giving the sick individual their own hand towel and switching out hand towels frequently. If you can't get over paper towels, then at least consider 100% recycled paper towels. The Natural Resources Defense Council (NRDC) notes that 544,000 trees can be saved annually, if every U.S. household replaced a single roll of virgin fiber paper towels with 100% recycled ones. Lastly, buy organic cotton or other sustainable material hand towels and change them out once a week.